Most commonly a conical hill or mountain built around a vent that connects with reservoirs of molten rock below the surface of the Earth. Uturunku (Quechua for jaguar, Hispanicized spellings Uturunco, Uturuncu) is a dormant volcano in the Cordillera de Lípez in Potosí Department, Bolivia. It is located in the Sur Lípez Province, San Pablo de Lípez Municipality. 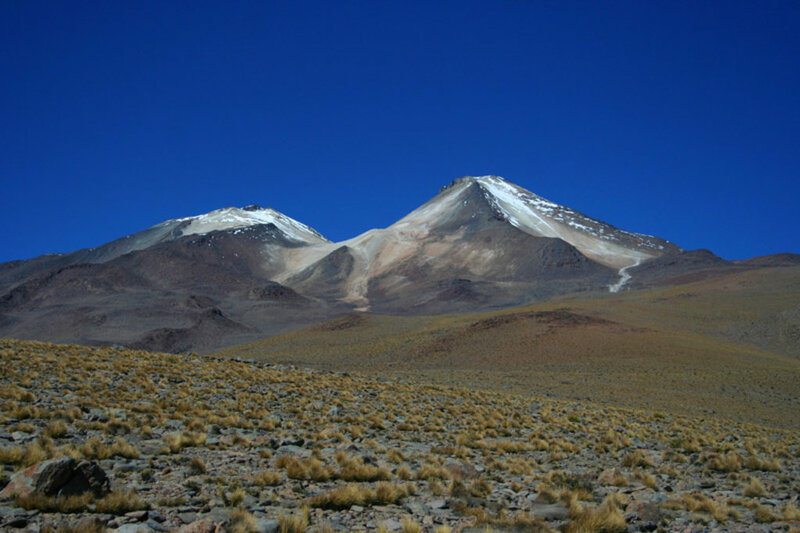 It is in the Central Volcanic Zone of the Andes, and its highest summit is 6,008 metres (19,711 ft) above sea level. The volcano has two summits, with a fumarole field between them. The volcano's landforms include lava domes and lava flows. The volcano was sporadically active during the Pleistocene, with the most recent eruption dated at 271,000 years ago. Since then, Uturunku has displayed fumarolic activity. Starting in 1992, satellite observations have indicated a large area of regional uplift centered on Uturunku, which has been interpreted as an indication of large-scale magma intrusion under the volcano. This might be a prelude to large-scale volcanic activity, including "supervolcanic" activity and caldera formation. Do you have photos of Uturuncu or know something about it? Please let us know!